About two months ago, I started a small project to see how SquareTags would work on virtual objects like web pages. Subsequent posts are here, here, here and here. This post summarized what I learned. Thanks to Phil Windley and his team for encouragement and support. One by one, I tagged a few web pages I control with a Square Tag and defined an object in my SquareTag personal cloud as illustrated below. I invited people to scan the tags and send me a Twitter ID or email address so I could respond. I received about 40 responses from nine states in the US, plus four other nations. Not bad for a little blog way out on the long tail of online information. I was able to easily link information in my personal cloud to the virtual objects. The personal cloud could potentially be a comprehensive repository for all my physical and virtual possessions. In the cases of Facebook, About.me and Paper.li (the Discovering Identity Paper), the tags are embedded in a .jpg image, so the host site probably doesn’t even know the links exist. Orange works just as good as black for SquareTags. I started by using photos of the adhesive SquareTags I purchased, but then created orange tags which encoded the SquareTag URL and code for each tag. I don’t think QR Codes are broadly used by most people. I had to explain to several people I know what the codes were and explain what they needed to do to scan a SquareTag. The user experience presented when someone scanned a SquareTag wasn’t optimized for this experiment. Only one field was available, so having people uniformly offer both a contact point (Twitter ID or email address) and location didn’t always work. Sometimes I would receive geo coordinates, but that required that a person opted in to use them. All in all, it was an enjoyable experiment. I think I’ll leave the tags in place for awhile, just to see if anyone else responds. After all, I got one out of the blue yesterday. Thanks to all who participated. I received about 20 responses, from eight states, plus the District of Columbia and Scotland. I was able to connect with most of the people who responded. However, since the SquareTag web app wasn’t optimized for collecting contact information, I still don’t know where some respondents were located. I enjoyed getting geotag information on several responses, but I didn’t receive geotag information on others, presumably since the respondent didn’t approve of sending the location information. The attention span of social media users is short. There were a few respondents each day I announced the experiment on Twitter, but then the response rate quickly fell to zero. Those who do visit aren’t very interested in an arcane blog tag experiment. That’s ok. I am used to living in the long tail. I want to thank Phil Windley and a couple of people from his team who helped me. They were very supportive, and I got to understand their intriguing technology platform a bit more. I will send a few suggestions their way, and hope to stay in close touch as the technology matures. I plan to keep the SquareTag in the blog header for awhile, to see if someone, on the odd chance, is still interested. 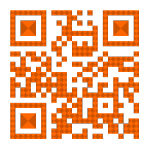 So, if you are so inclined, feel free to scan or click the SquareTag. I am a person. It starts with me. I own a Thing – this blog. It belongs to me. I control my Personal Cloud, which is a service hosted by SquareTag. It responds to my inputs and sends me messages. 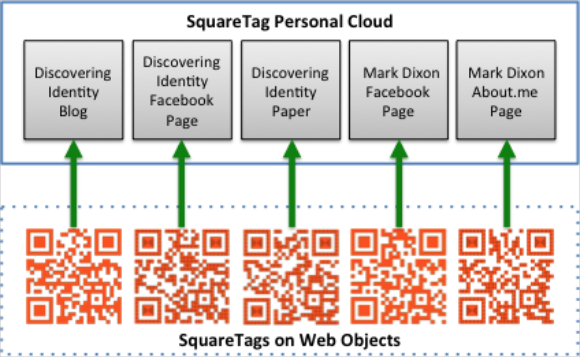 The Personal Cloud contains a SqareTag code for my blog. A person named John visits my blog and scans the SquareTag – a very temporary relationship. The action of scanning connects John to my personal cloud and is prompted to send a message to me. The Personal Cloud sends a message to me via SMS – including the GPS coordinates of where the scan was made and a text message, which includes John’s Twitter handle. I post a message to John on Twitter – another service to which I subscribe. John receives my message in the Tweet stream and responds to me. 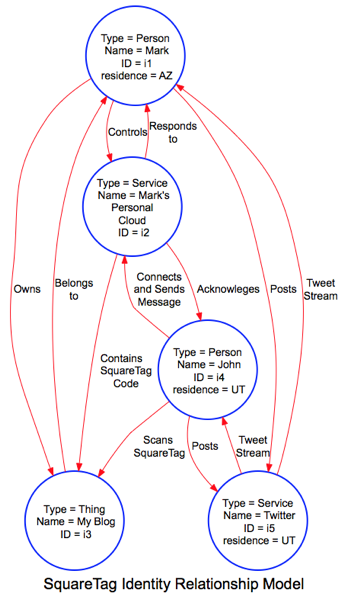 As I made this diagram, I become aware of a few things I need to refine in the Identity Relationship model. The graph edges (arrows) are relationships, but I think I have labelled some of them as data flows, rather than relationships. I need to come up with a way to differentiate between the relationship and information or messages that are exchanged because of the relationship. How should fairly static relationship (like blog ownership) be differentiated from transitory relationships (e.g. visiting a blog, scanning a SquareTag)? The diagramming software I use, Graphvis, has some decided advantages and disadvantages. Because it is data driven, I don’t have to keep re-drawing the diagram by hand. However, I don’t have much control over the esthetics of the diagram. If anyone has any feedback, I’d be happy to hear it. Last Saturday, as my previous post described, I launched a little experiment by SquareTagging my blog. I had to make a few adjustments as I received some responses back from the kind folks who participated in the experiment. Thanks to Phil Windley who was very helpful in answering questions and connecting me with a couple of the Kynetx developers. It was fun to get responses from five states (Arizona, California, Idaho, Nebraska and Utah). Thanks to all of you who scanned or clicked on the SquareTag. If you haven’t done so, could you please scan or click on the SquareTag in this post or in the header of the blog? I’d really appreciate it.